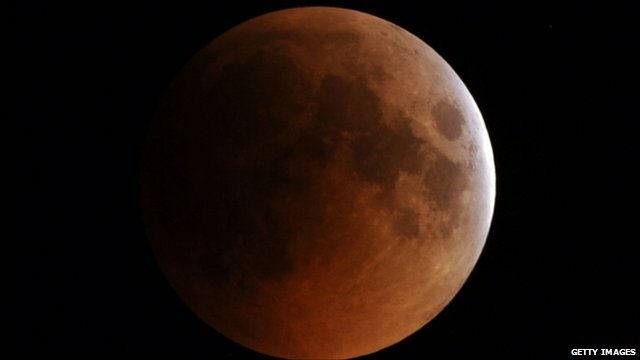 Skywatchers in parts of Europe, Africa, Central Asia and Australia have been watching the first total lunar eclipse of 2011 and the longest in nearly 11 years. This type of eclipse occurs when the Earth casts its shadow over the Moon. But indirect sunlight can still illuminate the Moon turning it a dramatic shade of red. The shadow started to fall at 1724 GMT and ended at 2300 GMT. "Totality" - when the lunar face is completely covered - lasted from 1922 GMT until 2102 GMT. The 100-minute period of totality was the longest since July 2000. Observers throughout Europe missed the early stages of the eclipse because they occurred before moonrise. However, totality could be observed throughout the continent except for northern Scotland and northern Scandinavia. In the UK, observers were able to view the eclipse from 2100 BST (2000 GMT). In the Americas, the totality was be visible from eastern Brazil, Uruguay and Argentina. But none of the eclipse was visible from North America. Eastern Asia, eastern Australia and New Zealand missed the last stages of the eclipse because they occurred after moonset.